The black navigation bar (figure 1) at the top of the page contains links to all the important pages you need to use the application. 1. Jazyk Logo: Click on the logo to go to the dashboard. The dashboard show an overview of all recent activity, including the stories you are currently reading. 2. Read: 'Read' brings you to the Reading list, a list of stories available for reading. If you want to start reading, this is the place to go. 3. Listen: Similarly 'Read' brings you to the Listening list, a list of audio stories. If you want to start listening, this is the place to go. 4. Messages: Click on the envelope to see a history of your messages. From here you can also send messages to users who follow you. 5. Gravatar: Your avatar, an image that is always shown next to your username. You can change this avatar on the gravatar.com, some more information on this can be found here. Click on this image to see your public profile. 6. User menu: Hover over or click on your user name, and a dropdown menu will appear (figure 2). The first link allows you to go to your profile page, where you can set your avatar or write some extra info about you. The link below sends you to the user settings pages where you can change configuration items such as the countdown duration and the background and where you can change your password and your email settings. 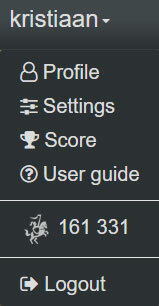 Right below is a link to the scores page, where you can see an overview of all the points and trophies you've earned. Next up is a link to the user guide you are reading right now. Your total points score together with the your rank icon is displayed below. Click on here to see the leaderboard. Finally, at the bottom, you can see a link to log out of Jazyk.